This weeks featured vendor is Whole in the Wall. 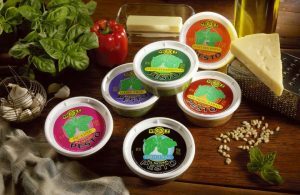 They are know for their delicious, world-famous pesto! Whole in the Wall started 36 years ago and were the first in Broome County to offer whole, natural and local foods at their restaurant. 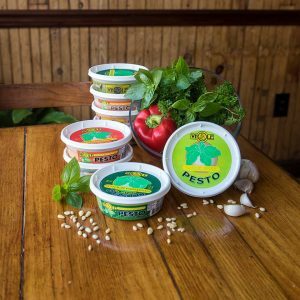 Their pesto was so popular that they decided to begin selling it on a larger scale. Now it can be found not only at the Broome County Regional Farmers Market every Saturday, other regional markets, grocery stores like Wegmans, but is also shipped nationwide! They offer 7 decadent flavors: Basil, Sweet Red Pepper, Chipotle, Sun-Dried Tomato (our personal favorite), Spinach Parmesan, Dairy Free, and the limited edition Garlic Spike. You can find Whole In The Wall on Saturdays at the market, check out their restaurant located at 43 S Washington St in Binghamton, NY, visit them online at Whole in the Wall or on Facebook at Whole in the Wall.